In July 1960, Christine Thomson, formerly secretary to Assistant Materials Engineer, Fletch. North, left for Hollywood, after three years at Standard’s. Having had experience of laboratory technicalities at Banner Lane and Fletchamstead, she was easily able to cope with work in the cosmetic lab. of Max Factor Ltd., Hollywood. After two years she has given up this work, to take on the job of being a housewife. Christine has just been married to Mr Nicholas Di Letto, of New York, and she had a real Hollywood wedding! Born in Coventry she has many friends at Standard’s and they join in sending best wishes and congratulations to the happy couple. In 1959, Christine’s younger sister, Sandra, was the first of the family to leave for America. She previously worked for Standard’s for three years as a typist in the C.K.D. Packing Department, under Mr W. G. Key. Sandra worked in California as a Nanny, before obtaining work as a secretary. In 1960, she married an American. Sandra was matron of honour at Christine’s wedding and Sandra’ husband was best man. The girls’ father, Mr Walter Morris, also an ex-Standard employee, settled in California in 1960, with his wife. He was with us for eleven years, and worked at Banner Lane, Fletch. and Canley. When he left he was chargehand in Gang 76, No. 5 Shop, Canley. 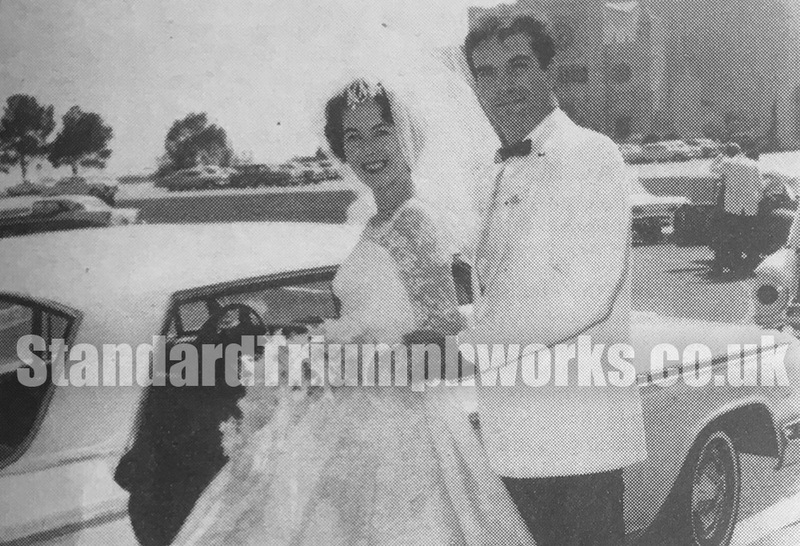 At the wedding was Mr Joe Smith, Standard-Triumph representative in Los Angeles, and his family, and Jaguar representative Mr. W. Taylor, and family. Also at the wedding was Miss Marilyn Whitehead – another ex-Standard girl She was previously secretary for 4 years to Mr. W. G. Key K. D. Supply executive, before she left in 1961 to take up employment with Max Factor in Hollywood and join her friend Christine. Christine’s husband, Mr Di Lotto, works for the Bendix Corporation, in San Fernando Valley and the newly-weds are living at 7262, Fountain Avenue, Hollywood 46, California, U.S.A.